Today nearly two million children are homeschooled in the U.S. Parents chose this route for a number of reasons including religious or moral considerations as well as academic and/or safety concerns. And then there are those, like us, who decided to homeschool because traditional alternatives were not meeting the needs of our children with learning issues. And we’re far from alone: a 2012 report from the National Center for Education Statistics, found that 16% listed special needs as their reason for choosing to homeschool. We made the decision to homeschool our two sons with LD six years ago, and it’s been a freeing experience. The decision came after trying other traditional educational options. The public school with its limited resources proved inadequate. Fighting the school system was a full-time, highly stressful job that provided limited results. Private schools designed to educate children with LD were far better than the public school, but were extremely expensive and presented other tradeoffs. Homeschooling gave us the ability to direct the educational path of our children, while at the same time removing our kids from the peer pressure to perform academically at a given grade level. As the sole decision makers, we were free to choose service providers, specialists, curriculum, and programs that we believed would benefit our kids. We selected the specific reading remediation and curriculum that we knew would work for each of our sons. Our choice of an Orton-Gillingham based reading program proved highly successful since it was delivered with the level of intensity that most schools (public or private) could not provide. Each of our sons saw at least three years of growth in their reading abilities in less than a year. Homeschooling allows you to provide the extended time, subject pacing, or one-on-one or small group learning that so many of these kids require to excel. In recent years, technology has also helped bridge the gap for many students with LD. For instance, online classes may be self-paced, or recorded, allowing students to go back and capture missed information or fill in notes that would pass them by in a traditional classroom. One of the things I often hear from parents is “how do you do it? I don’t have the patience!” One misconception is thinking you need to teach all subjects all by yourself. Look for collective support from the homeschool community in your area. It can connect you to tutors or interventions for your child’s specific needs while providing a source of knowledge and experience to draw upon. In recent years, online learning has become far more accepted and accessible. The internet offers a vast source of free curriculum. One in particular, Khan Academy, has expanded its course offerings, providing an array of subjects, including SAT prep. In fact, many local school districts have a free online version of their k-12 curriculum. Cooperatives or community learning groups are a great way of giving your child a small, intimate classroom environment without you teaching them directly. Many offer classes on subjects such as science, writing, art, history, or gym. Many times they are led by a parent with expertise or experience in that subject. Some parents collectively hire a certified subject-matter teacher and split the cost. For a child with LD, this provides the additional attention they often need. Social concerns exist for many children with learning disabilities and ADHD. Parents rightfully are concerned about how homeschooling will impact their child socially. A common myth is that kids who homeschool are socially isolated. It’s not a given, although it does require a concerted effort to seek out social opportunities or create group activities. The good news is that as homeschooling has become more mainstream, the number and types of organized activities specifically for homeschoolers has grown. Before we made our decision, I asked to join one of the groups and spoke to their members, so that I would have a sense of events and activities that were available in my community. One nice aspect of homeschool is that our children have the time in their day to express and pursue their interests and talents. When my boys were younger, they wrote articles for a homeschool newspaper, something I could never imagine them doing in a traditional school setting. There were three homeschool dances last year in our area, as well as the annual Shakespeare theater performance. For older students, deciding to homeschool through high-school also raises concerns of missing out on experiences associated with school such as attending the prom, specialty clubs, marching band, debate, student newspaper, team sports, or the yearbook. However, that doesn’t need to be the case. The difference is that you might have to seek out these experiences, or if not available, work to organize them on your own. One example is how we combined my younger son’s love of photography and Photoshop and used it to design a yearbook for his learning group. At the end of the year, he received many wonderful thank you notes from fellow students and teachers, including this one: “Thank you so much for doing this. Before I started homeschooling I was a little regretful that I would not have a yearbook. I showed it to my family – they were quite impressed.” I was able to give my son 0.5 credit for his work on this yearlong project, and the entire group of parents and students was truly grateful to have a keepsake of the year. One other question that I’m often asked is about the time commitment. 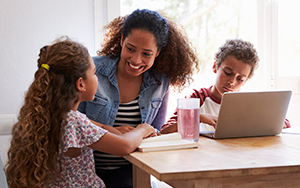 Working parents may not have the time to devote to educating their child, but they can direct tutors, or co-ops, or spend one-on-one time with their child during non-working hours. Keep in mind that the actual amount of time spent on core subject areas in most traditional schools is less than four hours a day. Other elective activities that take up the remainder of a child’s school day, such as gym, art, and music can be fostered in different ways. For instance, if your child plays a competitive sport, does he need two additional periods of gym class a week? That is something you can decide. Homeschooling is like any other educational decision that you make for your child with LD: It needs to be considered with your family in mind. It may be an overlooked solution to your child’s educational challenges—but one well worth considering. The author is the former Chapter Development Manager of Smart Kids with LD. She has been homeschooling her two children with LD for the past six years.